Shown with an 11×14 frame for scale. 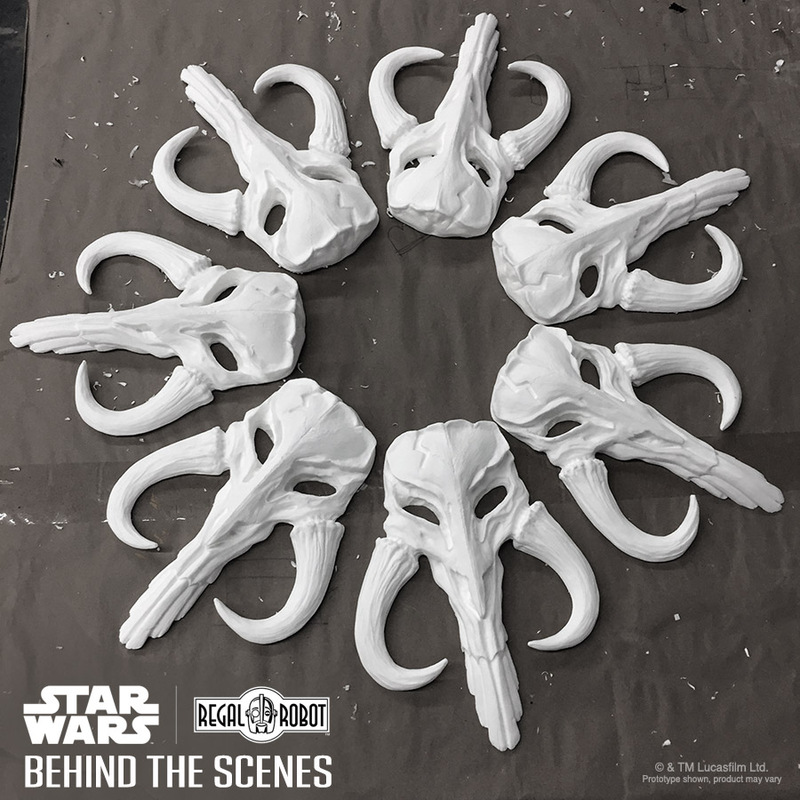 BEHIND THE SCENES – Our Star Wars™ Mandalorian Skull Plaque Wall Decor! 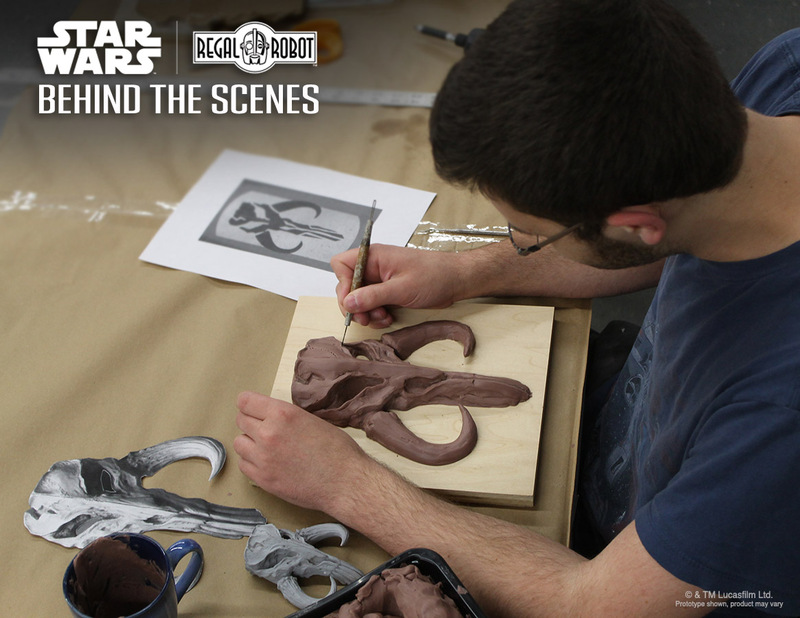 Here’s a behind the scenes look at another creation from our Mandalorian Skull collection. 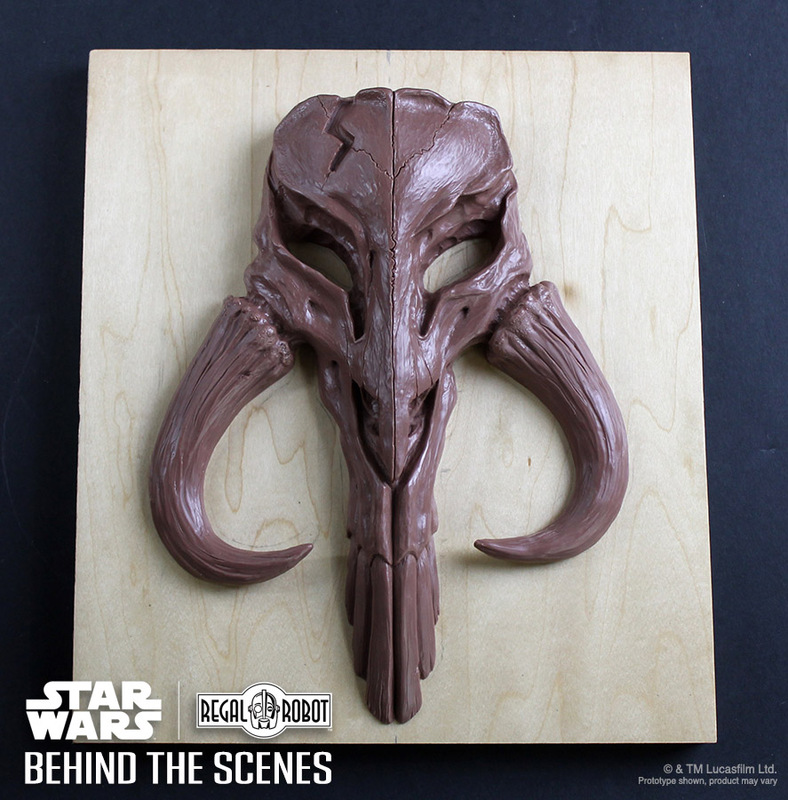 Often called a Mythosaur skull or Bantha skull by fans through the years, this 11″ tall wall plaque was inspired by the mysterious skull marking found on Boba Fett’s iconic armor. 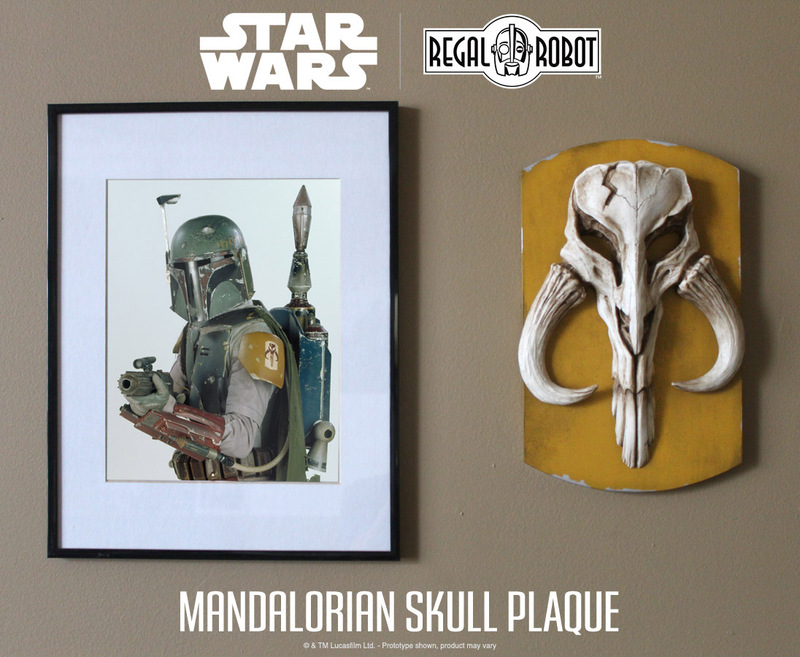 Ready to hang on the wall of your home, office or fan cave, you can see even more images and purchase yours on the Mandalorian Skull Plaque page in the shop. Like so many of our official Star Wars art, furniture and home decor items, we create these plaques right here in the USA. Each is hand poured, hand assembled, hand aged and hand painted by our artists right here in New York. With hands and clay, Steve blocked out the shape for our new wall decor creation! To create the 9″ tall skull in this wall display, we sculpted a relief sculpture interpretation of the Mandalorian sigil seen in the films on Boba Fett’s armor. It’s a realistic take on what that graphic may have looked like as a real skull! Sculptor Steve Richter worked in an oil based clay (appropriately called “Monster Clay!”) to hand craft our recreation of that skull. Once that sculpture was complete, silicone rubber molds were created to make a master copy in a resin material. That would be used to make the negative molds for production, where each copy would be poured, once again by hand, in our New York studio. The final clay skull sculpture, loaded with detail and ready to be molded! A kaleidoscope of fresh castings, ready for hand paint and staining! The castings are all resin, a dense polyurethane plastic material, and start off bright white. To achieve a realistic bone color, each are hand stained by our artists with layers of color to stain and age them. 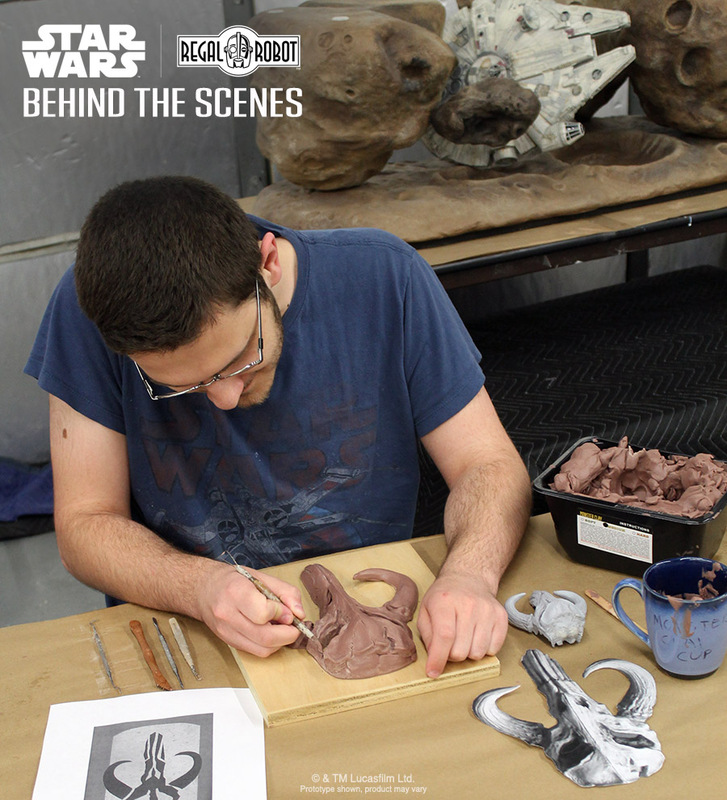 This process also enhances and magnifies all of the wonderful sculpted details, making each creation a unique work of art. The skulls are then attached to wood plaques which we age and stain in a style reminiscent of Boba Fett’s armor. When we say, “from our hands to yours,” we really do mean it! Our artists hand craft each plaque! 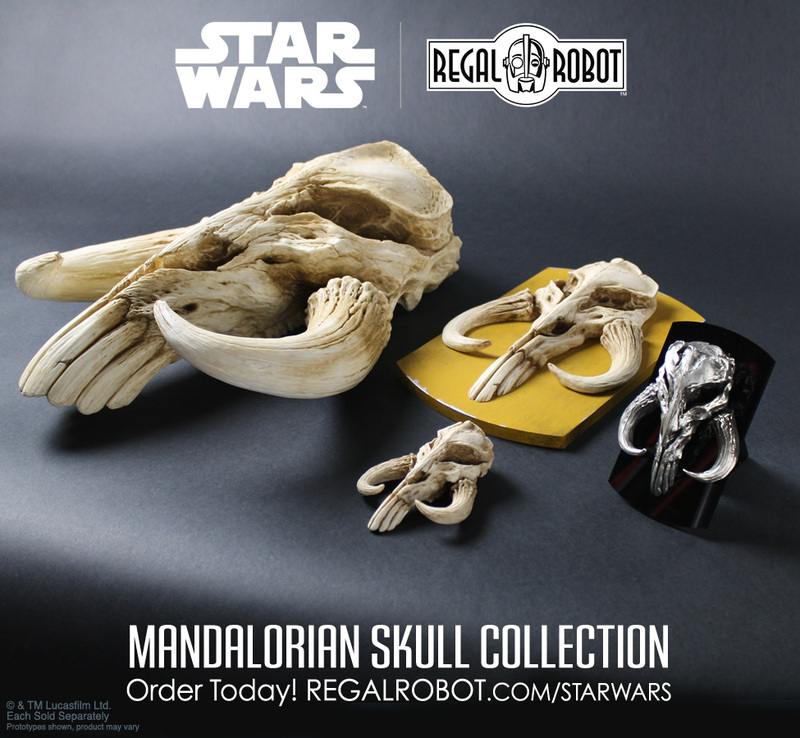 Part of our Mandalorian Skull Collection featuring great sculptures and decor! 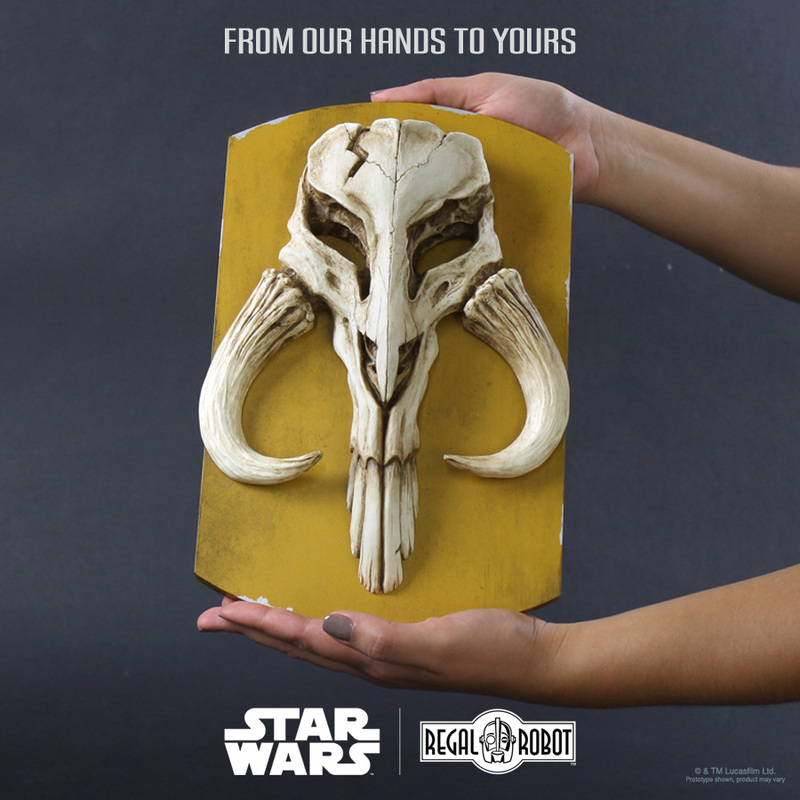 Each Boba Fett inspired skull comes in a full color box with foam padding and thank you note with credits to the artists involved. You can order your skull plaque today in our Star Wars furniture, art and decor section and also see all of our current official Star Wars furniture, art and decor products for your home, office or fan cave! And remember – We love creating original works of functional art for specific clients who dream as big as we do. Click here to make learn more about our unprecedented Custom Studio Services or make your custom Star Wars furniture or decor request here today!